The ESPN broadcast schedule is set. And the one remaining piece of business for Hawaii football coach Greg McMackin -- the vacancy on his staff -- is finished as well. Alex Gerke officially joined the Warrior staff yesterday, hired as running backs/offensive line coach. Gerke spent the past two seasons as offensive line coach at Weber State, Hawaii's first home opponent Sept. 6. "I'm looking forward to that game," Gerke said yesterday. "It's a good squad and Ron (coach McBride) will have the boys ready. "I'm really looking forward to working for an outstanding head coach in Greg McMackin, being part of the University of Hawaii football family and I'm excited to keep what's been built here moving. I've always felt that this was the Shangri-La of coaching. Being here is just surreal." An offensive lineman, who played at Utah under McBride, Gerke's coaching resume includes stints with the Utes and Cal Poly. Known for wearing shorts and tank tops on the practice field, Gerke said he couldn't wait to hit the beach this weekend; he left Ogden, Utah, earlier this week, getting out ahead of a huge snowstorm. Gerke has spent many summers in Hawaii, helping at coaching clinics on Oahu and Maui. "He loves coming to Hawaii," McMackin said, "and we're happy we can make it a little more permanent. He's exactly what I'm looking for in a coach. Besides his experience, he really cares about players. He's going to really complement our staff and be a great addition." 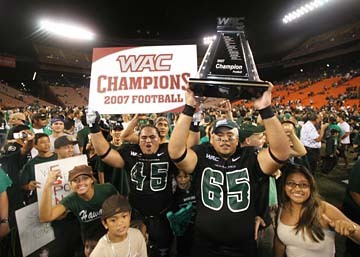 Jason Laumoli and Hercules Satele celebrated with fans after Hawaii clinched the 2007 WAC title with a win over Boise State. The Western Athletic Conference announced its complete 2008 football schedule yesterday, including 10 games slated for national television broadcasts. Among those 10 to be shown on ABC, ESPN or ESPN2 are several matchups with Bowl Championship Series conference teams. The first such game pits Louisiana Tech against Mississippi State of the Southeastern Conference on Aug. 30. The following two Saturdays also feature games against BCS schools -- Nevada hosts Texas Tech of the Big 12 on Sept. 6 and Wisconsin of the Big Ten visits Fresno State on Sept. 13. The final nationally televised game between a WAC team and a BCS team will be one of Hawaii's final two regular-season games -- Nov. 29 vs. Washington State of the Pac-10 and Dec. 6 against Cincinnati of the Big East. The biggest of the six conference matchups scheduled to be aired nationwide is a rematch of last season's de facto conference title game, Hawaii's home win over Boise State. The Warriors visit the Broncos on Oct. 17, with the game scheduled to start at 2 p.m. Hawaii time. Oct. 11 vs. New Mexico St.
Oct. 18 vs. Utah St.
Nov. 15 vs. San Jose St.
Nov. 22 vs. Boise St.
Oct. 18 at New Mexico St.